My curiosity begs to understand life. My mind longs for logic. I am not overly fond of ungraspable concepts. When I was a child I asked a million questions. Why is the sky blue? Are angels all men? Why do bad things happen? Why can't we send my brussel sprouts to the starving children in Africa? Who created God? Give me a story that grabs my attention at the beginning. Fill it with intrigue. Throw in some high conflict and drama in the middle and then catch the bad guys, tie up the loose ends and call it done. Cue the applause. Bring down the curtain. But don’t even think about leaving me hanging… and certainly don’t ask me to tune in next week for the missing story-pieces. Now that you are clued in on a bit of my “crazy,” you can imagine how I reacted as a youngster when the concept of infinity was introduced in math class. Suit me up for a straight jacket and take me to a rubber room. I thought my math teacher was nuts. You mean I’m supposed to comprehend, work with and accept something that has no beginning and no ending? Really? That’s not neat. It’s not simple. It makes my brain hurt to even think about it! Pure frustration, packaged in a sideways figure eight. Once I rose above the psychological drama-trauma of this new math concept, I figured out how to solve problems with infinity: even though I couldn’t wrap my brain around it. I completed my homework assignments and passed the tests – without so much as running my fingernails down the chalkboard in a defiant, adolescent tantrum of revolt. Miracle. There are a few characteristics of God that I find difficult to grasp. As you may have guessed, His eternal nature is one. It’s not easy to understand. As much as my inner four-year-old would like it to, the Bible does not begin with once upon a time, and it does not end with and they all lived happily ever after. The love saga of God, written in crimson by Christ, is a mystery that began before the dawn of time and goes on forever. God's existence defies space, matter and time. It transcends it! There is no one like Him, not one. Not now. Not ever. He is uniquely and mysteriously eternal. He is El Olam: The Everlasting God, El meaning “mighty one,” Olam meaning world, universe, everlasting time or space. [i] His existence cannot be featured on a timeline because it does not come neatly packaged with a clearly defined beginning and ending. In fact, He is the Beginning and the End – the Alpha and Omega – the First and the Last. I would guess that, like me, you love the thought of God as your refuge. My heart completely resonates with the concept of His everlasting arms beneath me. Holding me. Protecting me. Guiding me. Do I fully understand it? Not at all… but it sure does help me to accept the concept of God’s eternal nature. More than that, it helps me to embrace His infinite nature. When we allow the One who is beyond space, matter and time into our space, matter and time, we position ourselves to experience El Olam as a refuge for all eternity. You and I run out of energy. We grow weary. We lose heart. God never does. The Everlasting God does not faint or grow weary and when we call out to Him, He renews our strength and revives our hope. Yeah. I’m the girl who wants life to make sense, but I’ve been learning that there are some things in life that we just need to accept, rather than understand. Things we need to take at face value… at faith value. For me, this is one of them. I worship El Olam – who was and is and is to come. Infinite Grace. I’m so grateful that on the day my lungs exhale my final earthly breath and my eyes lift to see Jesus face to face, all my questions will be not only satisfied, but also forgotten. Not just for a moment, but for all eternity. Heavenly Father, El Olam, Everlasting God, You surely are great! You are the most amazing mystery I will ever know. Help me to trust You, beyond my understanding. Increase my faith, and help my life to reflect Your infinite grace. Our problems are finite… they have a beginning and an end. God’s ability to meet us at each challenge is not limited by space or time. Are there people or challenges with which you feel God is calling you trust Him deeper with? Let’s take this conversation deeper. Leave a comment or response on my blog or on my facebook page. 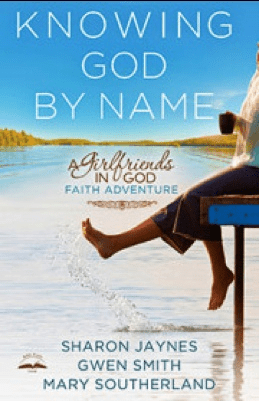 Today’s GiG devotion is adapted from Knowing God by Name by Sharon Jaynes, Gwen Smith, & Mary Southerland by permission of Multnomah, division of Random House, Inc. All rights reserved. No part of this excerpt may be reproduced or reprinted without permission in writing from the publisher. TWO DAY GIVEAWAY:Get a FREE Uncluttered CD when you purchase the Girlfriends in God book, Knowing God by Name. ONLY from the store at GwenSmith.net.